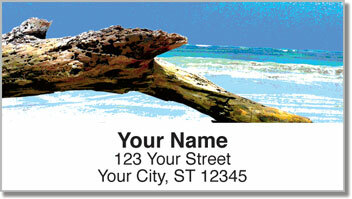 Water worn driftwood lays on the beach next to a brilliant blue shoreline on this scenic set of return address labels from CheckAdvantage. When you look at them, you'll feel like you are all alone next to the sea, listening the waves crash and seagulls call out from above. 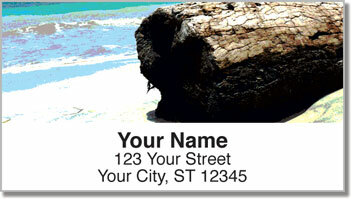 It's a refreshing finishing touch for all your letters and packages. Unfortunately, you can't spend every day at the beach. There's work to be done. But now one of those tedious tasks is about to get a whole lot easier. 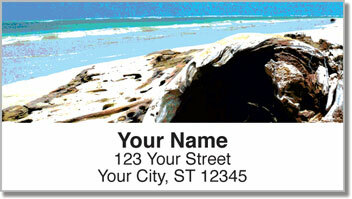 Preparing mail with your new self-adhesive labels is a snap! Just peel and place them on every envelope. 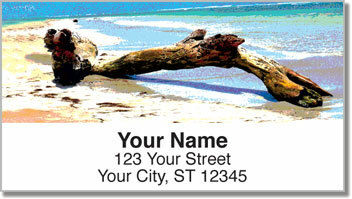 Order your very own Driftwood Address Labels right now! You can also get matching personal checks.